and lasts for around 40 days. This period is also called Spring Festival travel season, or Chunyun period. The number of passengers during the Chunyun period has exceeded the population of China, hitting the 2-billion mark in 2006. The best posts will be placed on the QQ BBS news page. 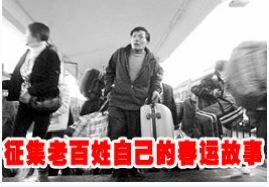 Spring Festival travel is a worry for poor people–what is there to share here? Have you been to the train stations and had a look? I’m a student, and our school didn’t manage to get tickets for us. I went and lined up myself for over 2 hours, and then all I could get was a standing-room ticket! For a more than 20 hour trip! Tomorrow I’ll be going home–I don’t dare think of it! I wasn’t able to get a ticket, at any rate. I don’t know how to go home, I don’t have enough money?